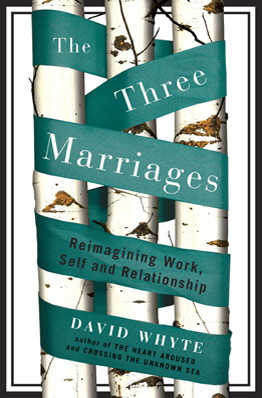 David Whyte wrote a wonderful book on The Three Marriages: Reimagining Work, Self, and Relationship. In work we have to find high ground safe from the arriving tsunami of expectation concerning what I am going to do. Work, like marriage, is a place you can lose yourself more easily perhaps than finding yourself. It is a place full of powerful undercurrents, a place to find our selves, but also, a place to drown, losing all sense of our voice, our own contribution and conversation. Are you finding yourself or losing yourself in your work? I encourage you to engage yourself with David Whyte’s The Three Marriages.